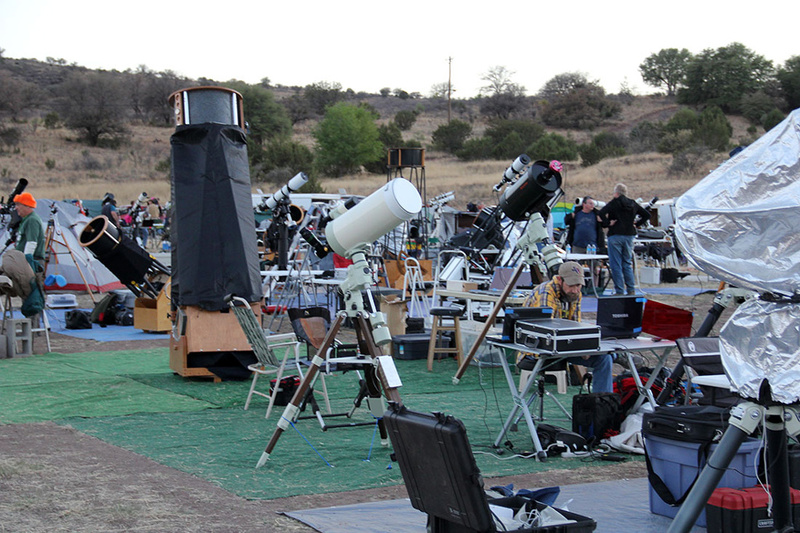 In West Texas near Fort Davis, the Texas Star Party (TSP) has been going strong since 1979. What began as a gathering of fewer than 100 astronomy enthusiasts has blossomed to between 400 and 800 attending during subsequent years. Having moved to the Lone Star State only a year ago, I was excited to make the scenic seven-hour journey to Prude Ranch to experience this star party firsthand. Sunday, May 5, kicked off the first night. After setting up our telescopes and having supper at the dining hall, we headed out to observe. The variety and number of telescopes on the three observing fields was a sight to behold. Star atlases and eyepiece cases were opened, imagers were firing up their computers, and I had just sharpened my pencils and blending stumps. The clouds and a few sprinkles ended the session shortly after 1 a.m., but many of us had already logged several targets. It’s no surprise that at some point, most telescopes were aimed at Omega Centauri (NGC 5139), mine included. In fact, I couldn’t resist grabbing a sketch of both it and nearby galaxy Centaurus A (NGC 5128). Monday and Tuesday were all-nighters with very little sleep afterward. Although clouds and rain put a dampener on observing during the following early nights, the skies cleared enough for those willing to hang in there for sucker holes. Some worked on observing lists while others imaged or sketched. The hum of camaraderie was unmistakable. As if weeklong observing under dark skies wasn’t enough, the organizers of the TSP had plenty of activities available for us to participate in. Amateur astronomer Jimi Lowrey lives quite close to the Texas Star Party site. On several nights, I visited his home and used his 48-inch reflector. Speakers were provided in the afternoons and evenings and included presentations from Zoltan Levay of the Space Telescope Science Institute, who talked about the Hubble Space Telescope, Judit Ries of the University of Texas speaking about “Cosmic Collisions,” a report on the APOGEE Survey by Matthew Shetrone of McDonald Observatory, and “Tales of a Celestial Sleuth” by Don Olson of Texas State University. Other speakers presented on such topics as amateur telescope making (ATM), the International Dark-Sky Association, and the Scope Check Using Resolution Target (SCURT) used to estimate the resolving power of your telescope in arcseconds. The Texas Imaging Symposium 2013 also took place during the week, catering to novices and experts alike. Organizers even provided activities for spouses and other family members by organizing a reading club, an English Tea, a tour of the Big Bend Museum, and bird walks. 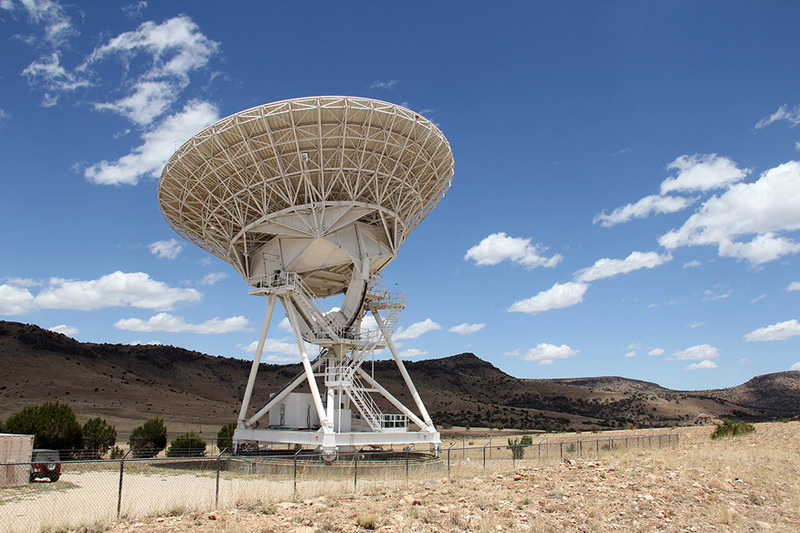 This dish operates at the National Radio Astronomy Observatory’s Fort Davis site. Vendors were on site toward the middle of the ranch, and I couldn’t help but purchase a hooded observing vest from Dark Skies Apparel plus a few other “must have” goodies. Those with gear to sell were provided with a Swap Meet toward the end of the week and bulletin boards to post ads during the week. I was particularly thankful for the bulletin boards, as someone was kind enough to pin my lost glove to it. During the week, my spare time was spent trekking the Davis Mountains, and I took the TSP-organized McDonald Observatory tour. The National Radio Astronomy Observatory is just 2 miles down a dirt road next to Prude Ranch, and we were able to view the historic Sproul Ranches (established in 1886) while there. Midweek, a few of us drove to the Fort Davis drug store for an ice cream social, where we discovered that coffee-flavored ice cream and hot fudge make a perfect combination! 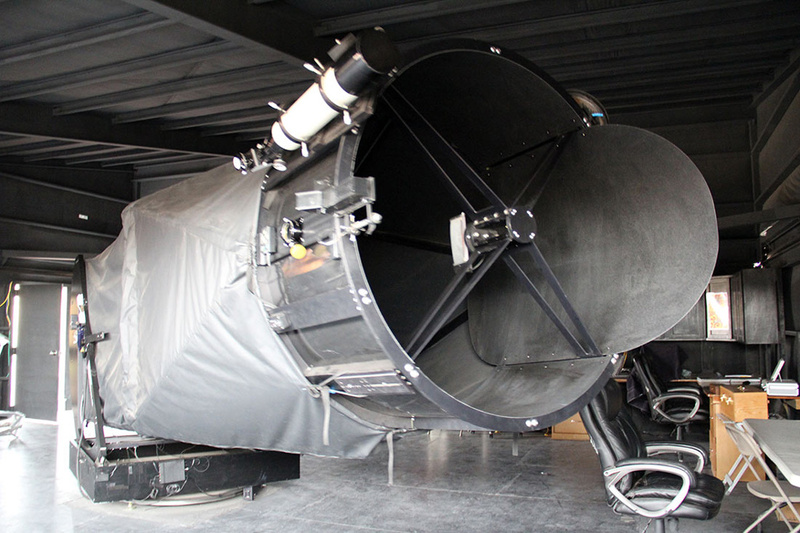 The 107-inch Harlen J. Smith Telescope is the main instrument at McDonald Observatory. 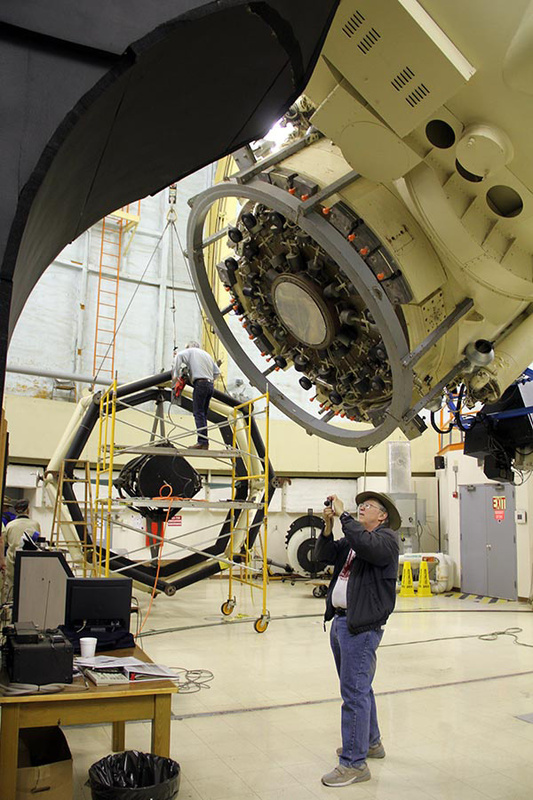 During the 2013 Texas Star Party, organizers made it possible for attendees to take a tour of the professional facility. 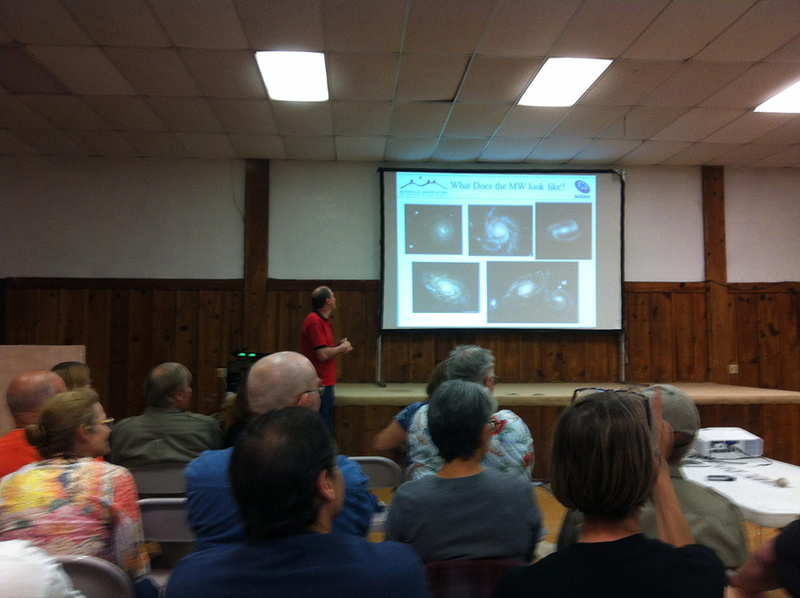 Amateur astronomer Dave Mitsky appears in this picture. If you’ve made the trip to the TSP in the past, chances are you’ve heard about Jimi Lowrey’s 48-inch reflector just down the road. Jimi and his wife, Connie, are gracious hosts and had me over a few times during the week. We spent two of those nights observing and comparing notes with fellow sketchers from Germany. I soon forgot my fear of heights by sheer desire to witness stunning views — views I wouldn’t have believed had I not seen them with my own eyes. The week ended with awards for ATM, astrophoto/sketching entries, and those who completed various observing programs. Add a group photo in the mix with a splash of “YMCA” and the week was over. Before heading home, I met a couple friends for breakfast at the Fort Davis drug store. After we said our goodbyes, I sat on an outside bench for a while and basked in the wonderful memories of the week just passed. To the TSP organizers, volunteers, other astronomy enthusiasts and the Prude Ranch staff, thanks for making my first Texas Star Party so enjoyable!